ADJ will continue its celebration of 30 Years of Pure Lighting Excitement by demonstrating three innovative new products at this month’s Prolight + Sound trade show in Frankfurt, Germany. Lucky visitors to the ADJ stand (Hall 11.0, Stand D51) will get to see the Kaos, Vizi Beam 5RX and AV6 in action, while 25 other new products developed over the last six months will also make their European debut. 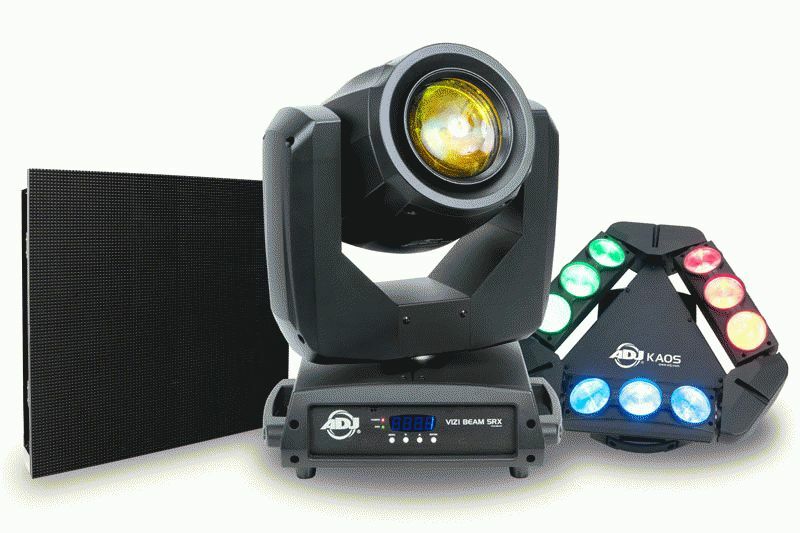 Set to cause the most excitement is the brand new Kaos – an incredible product that offers dual-movement and concise beams for distinctive, attention-grabbing effects that bring pure lighting excitement to any venue or event. This impressive centerpiece fixture utilizes three lighting beam battens, each housing three 10W quad-color CREE LEDs. These battens are mounted on a rotating base in a distinctive triangular arrangement. What makes the Kaos so unique is that each of the battens has independent tilt movement (at 60~150-degrees) while the main central body also offers multi-directional rotation, allowing users to send nine tight beams of colored light scattering across the room and slicing through the air for an eye-catching lightshow like no other. Visitors to Prolight + Sound 2015 will also be treated to a preview of ADJ’s new Vizi Beam 5RX, which builds on the success of the ADJ Vizi Beam 5R with the addition of motorized focus and the bonus of having a more competitive price point. The new, fast-moving fixture uses the same revolutionary Philips Platinum 5R 189W discharge lamp – co-engineered by ADJ and Philips – to offer a light output comparable to a regular 575W fixture. This, combined with a super-tight 5-degree beam angle, enables users to create powerful, concise beams, while independent GOBO/color wheels and an 8-facet prism offer an array of vivid color hues and spellbinding effects. With the addition of motorized focus, the beams generated by the Vizi Beam 5RX can remain focussed, no matter where users point them, making for highly adaptable effects and professional results. Adding to all the excitement, the show in Frankfurt will mark an important development for ADJ, as it prepares to showcase its first ever video wall. The ADJ AV6 is ideal for nightclubs, bars, lounges, churches, and to be used by event productions and mobile entertainers; in fact anyone looking for an effective, reliable and affordable modular LED video wall system. Multiple AV6 panels can easily be linked to create large walls of any shape and size. Each AV6 panel has 6mm (0.25”) pixel pitch, a brightness of 1,200 nits and an overall weight of just 23 lbs. (8.15kg), making it a lightweight but impactful video wall solution. Displaying ADJ’s commitment to both innovation and affordability, the AV6 allows users to transform any venue with LED screen visuals and bring pure lighting excitement to events on budgets that would have previously been impossible. With such a range of forward-thinking products on display, ADJ looks set to steal the show at Prolight + Sound. Visitors heading to the ADJ stand will be able to experience these brand new lighting solutions first-hand, while the ADJ team remains close by to take questions and offer advice!